When the electoral college met on the first Monday after the second Wednesday in December (December 19, 2018) most of the electors voted for the presidential candidate they were pledged to (Clinton or Trump), but some electors had different plans. How many electors did NOT vote for the candidate they were supposed to vote for? If you were an elector, and your state’s electoral votes were supposed to go to someone you did not like, would you follow your state’s will or would you cast your electoral vote for the person you preferred? Should the U.S. allow faithless electors (electors who go against the will of their state)? Let’s say that you believed that electors should be forced by law to vote the way their state voted, what steps could you take to do something about that? Explain the connection between the electoral college and federalism? 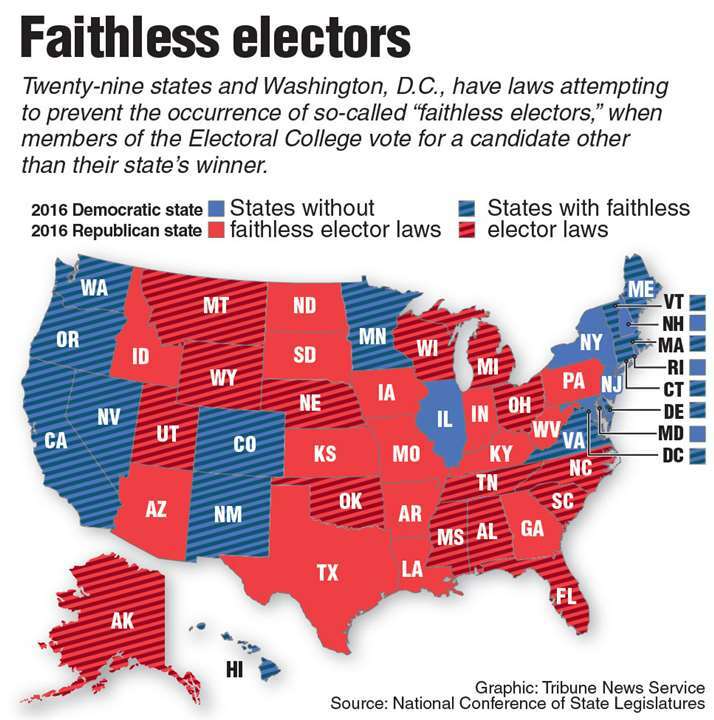 Explain whether faithless electors are acting democratically. According to the Article II of the U.S. Constitution, what would have happened if Faith Spotted Eagle got 270 electoral votes - all from faithless electors - would she have become the president? What if Faith Spotted Eagle didn’t meet the Constitutional requirement of being 35 years old (she actually did - this is just a hypothetical). Would she still become president? In a case like that, who would decide about the presidential eligibility of Faith Spotted Eagle? When it lays out presidential requirements, does Article II of the U.S. Constitution say anything about species or can only humans be president? Faith Spotted Eagle was the first Native American to ever receive an electoral vote. How about that! If there had been an electoral college tie of 269 electoral votes each for Clinton and Trump, who would have broken the tie? Claim: the electoral college is proof that the framers of the Constitution wanted an elite democracy with a strong check on the will of the people. Based on your knowledge of the U.S. political system, respond to this claim. What is one question you have about this topic? Draw a picture of the electoral college. You don’t need to draw a masterpiece, just use stick figures or symbols or whatever it takes to symbolize the electoral college. And you can draw the electoral college in just 10 seconds or less. Look at your drawing. Today’s class starter courtesy of Mr. Jason Hyjek - a great teacher in Brooklyn, New York. Thanks, Jason! Check out this absolutely ugly, old-fashioned, but full-of-great-facts website from the national archives about the electoral college. In most States, the political parties nominate slates of electors at State conventions or central committee meetings. Contact your state Republican or Democratic party and apply to be an elector in your state. Share your results in class or online.